A lot of wrecks, a healthy kelp forest, steep walls, colorful soft corals, exiting marine life and potentially breathtaking visibility. 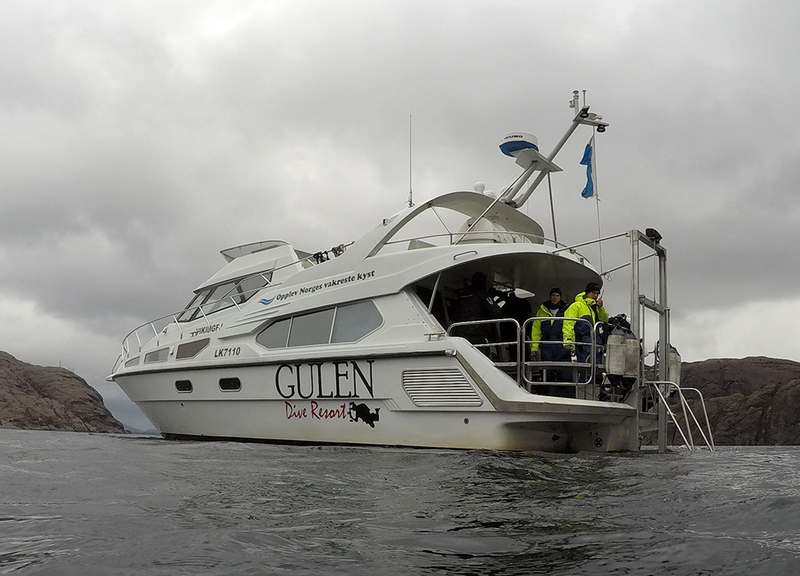 Add a friendly staff, excellent accommodations and a comfortable boat, and you have Gulen Dive Resort. 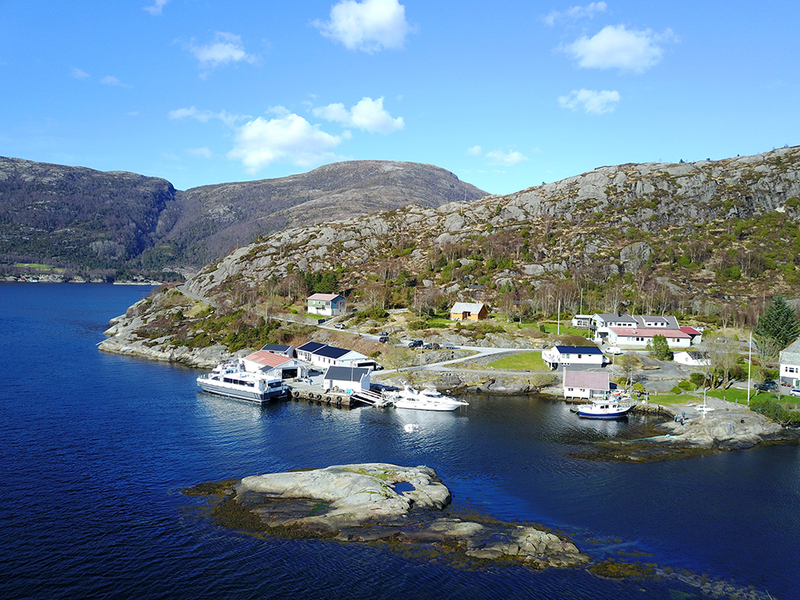 The resort is located strategically at the inlet of Norways deepest and longest fjord; Sognefjorden. 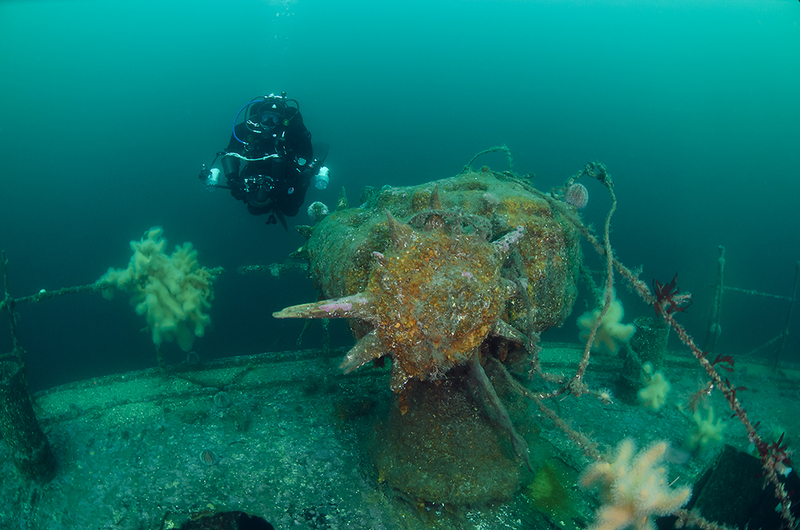 Some of the best wrecks in Norway is only a short boat ride away. 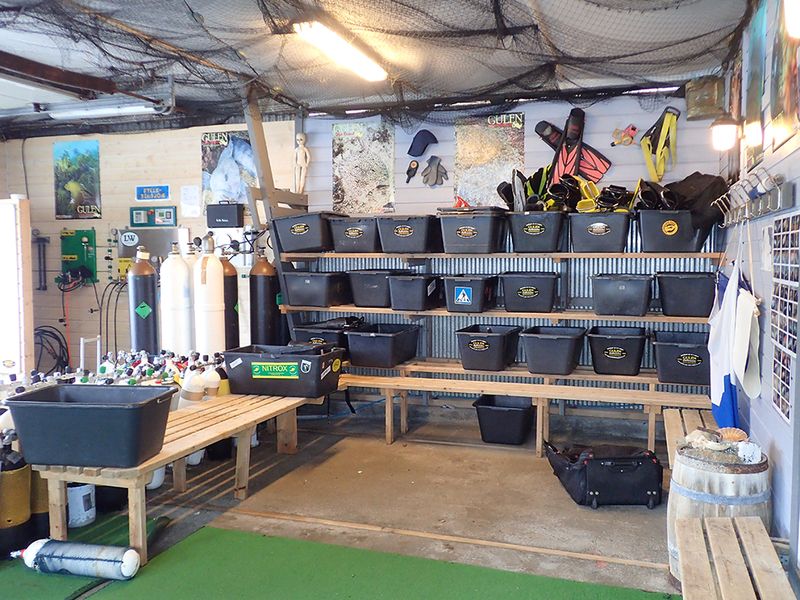 Last year we won a free long weekend at the resort and decided to explore their dive sites during our Easter holiday. Gulen Dive Resort in beautiful surroundings. We started at the top. 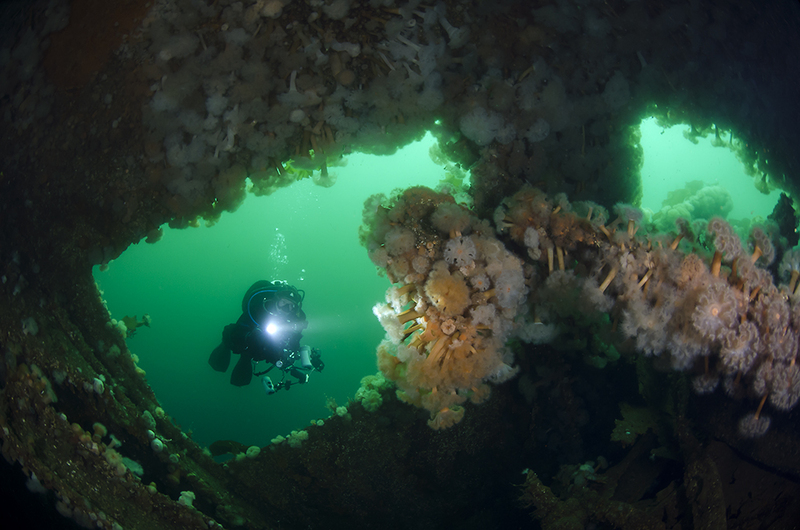 The wreck of the German cargo freighter Frankenwald has been voted for Norways best wreck. 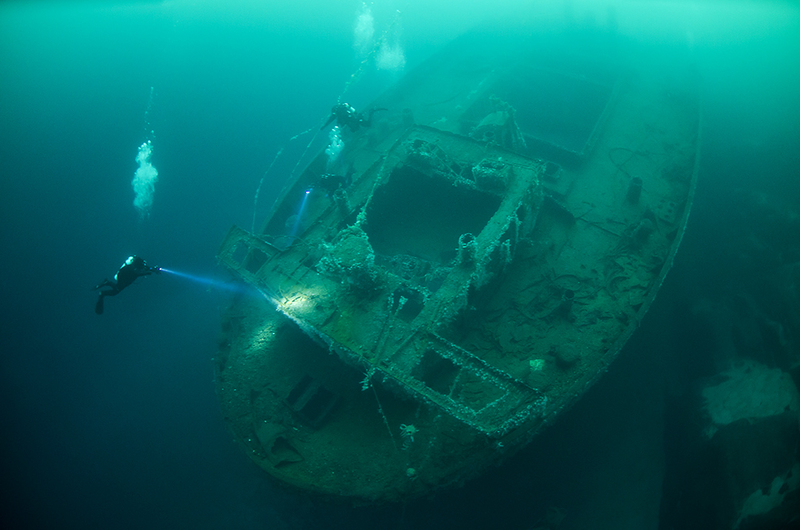 Frankenwald went on ground 6th January 1940 and positioned herself on her keel at a depth of 40 meters. Her rear mast goes all the way up to 7 meters, while the deck is located at approx. 30 meters. 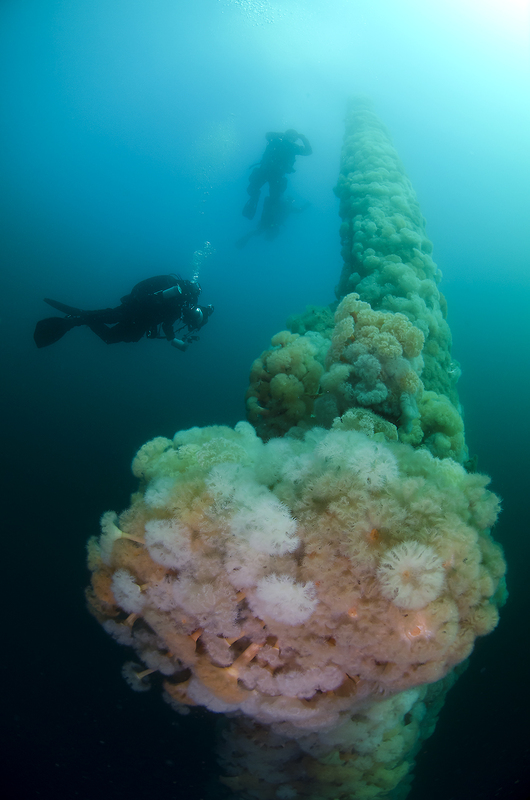 The 122meter long wreck is too big to explore on just one dive. We decided to explore the stern before we ended the dive on the rear mast which is covered with soft corals in white, yellow and orange color. On our second dive, we went looking for stingrays. They didn´t show up, but we retrieved the anchor of “Vikingfjord”, which was stuck on a previous trip. Our reward was a jug of beer from the dive resorts own bar; “200 bar”. The “Vikingfjord” has an excellent elevator for lifting the divers out of the water. Exiting the water has never been easier! The dive day wasn´t over yet. We decided to check out the iconic house reef. Here we met the local hero’s; Larry the lobster and Eric the wolfish. 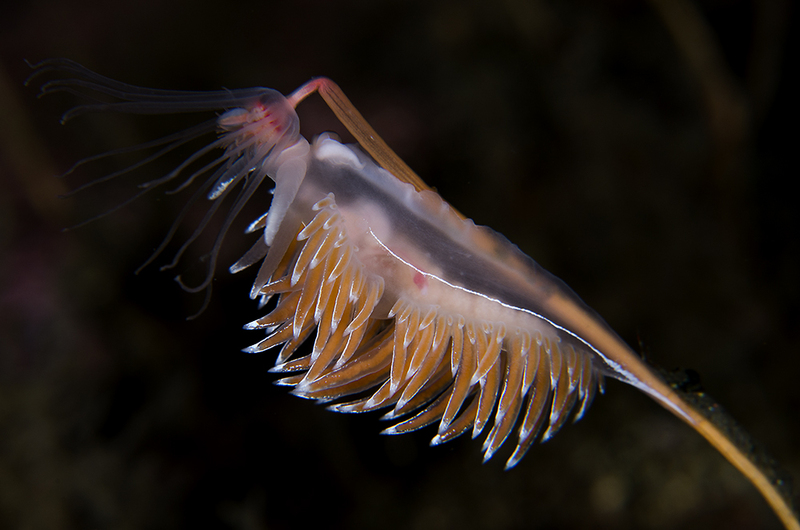 The real stars of the hose reef are the nudibranchs. 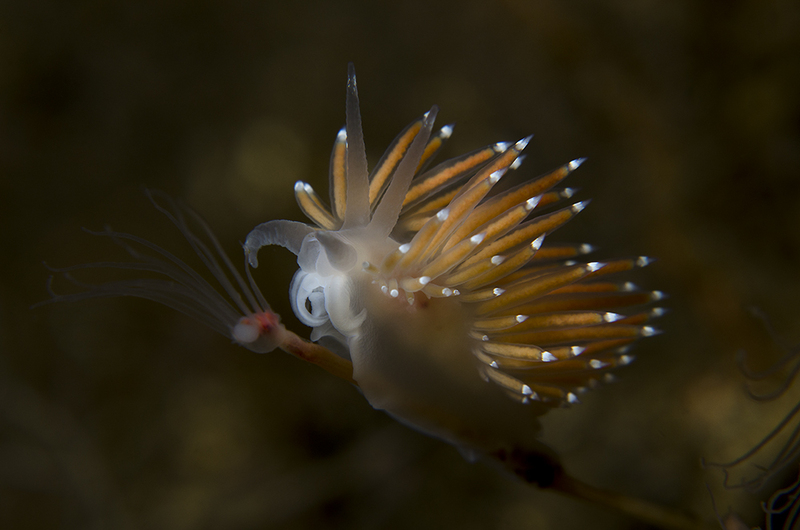 82 different types of nudibranchs have been found at the hose reef throughout the years. We are not nudi-nerds and only found the usual suspects. But we enjoyed the excellent photo and video opportunities they gave us. Day two started just as good as day one. “Vikingfjord” headed for Krakhellersundet and the twin wrecks of Ferndale and Parat. On the 15th December 1944, a German convoy sails through Sognefjorden during the night to avoid the british air strikes. Ferndale is leading the convoy, but crashes into Seglsteinen which is a hugh rock located in the middle of Krakhellersundet. The remaining convoy continues to Ålesund, while Ferndale is waiting for help to be pulled of ground. When daylight arrives, she is a sitting duck as the British have taken control of the airspace in the area. The salvage ship “Parat” is coming to the rescue, but it is too late. They are discovered and the feared Mosquito airplanes dives towards the ships and releases their bombs and missiles. Ferndale and Parat are doomed and sinks. 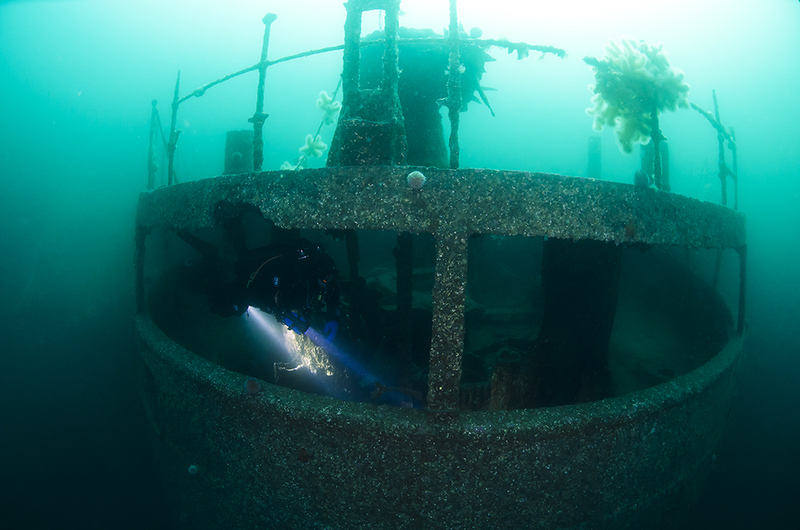 Today the wreck of Ferndale starts at 10 meters and goes down to 40 meters. The shallow part is broken down, but the stern is intact and impressive. Below the stern of Ferndale, we can see the small salvage ship Parat. She has a maximum depth of 60 meters and should only be explored with the use of trimix. 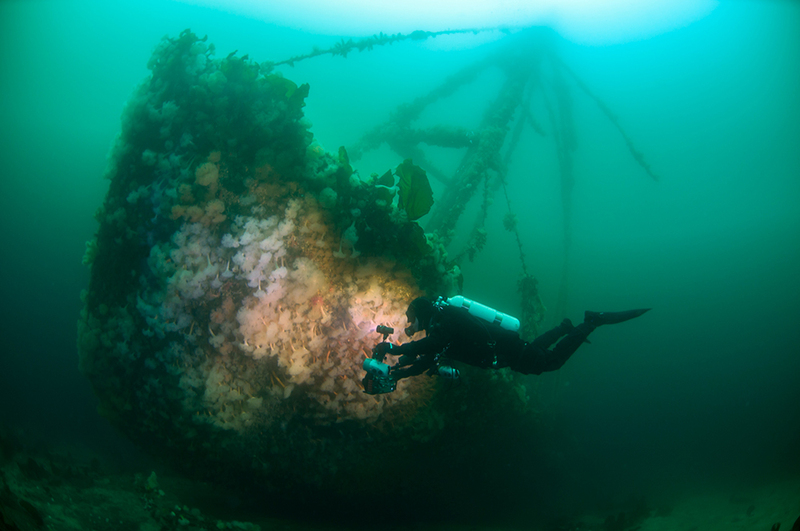 The end of the dive is just as impressive as the wrecks. 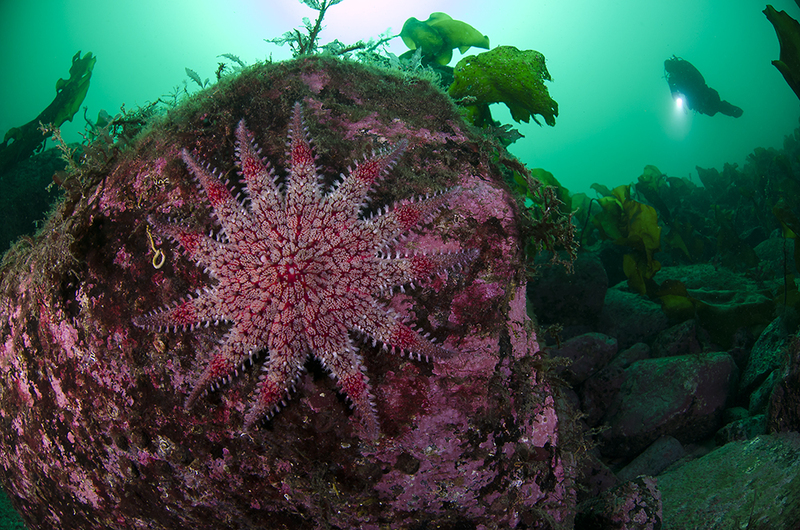 The big rock “Seglsteinen” is covered with soft corals and a beautiful dive site in itself. 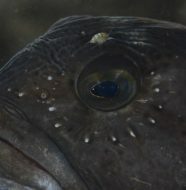 The second dive was the small wreck of Solvang II. This small cargo ship lies at 25 meters and here mast goes all the way up to four meters. 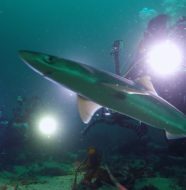 After the dive, Vidar teared his neck seal again, but luckily the old suit was in the car for backup and had to save the lasts dives of the trip. 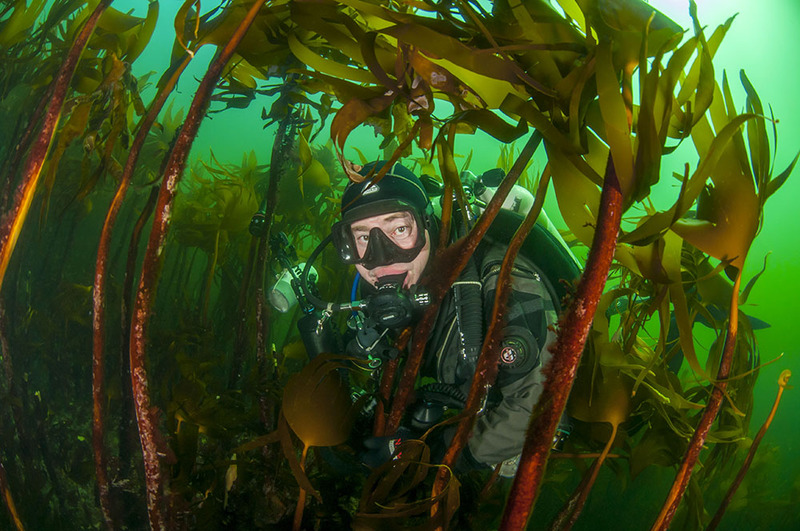 We visited the house reef again in the afternoon, and on the third day we had a nice dive in the kelp forest far out of the fjord. We would like to thank Ørjan, Monica, Guido, and Adrian for giving us an excellent Easter holiday. Visit the resort online to see more of what they can offer. 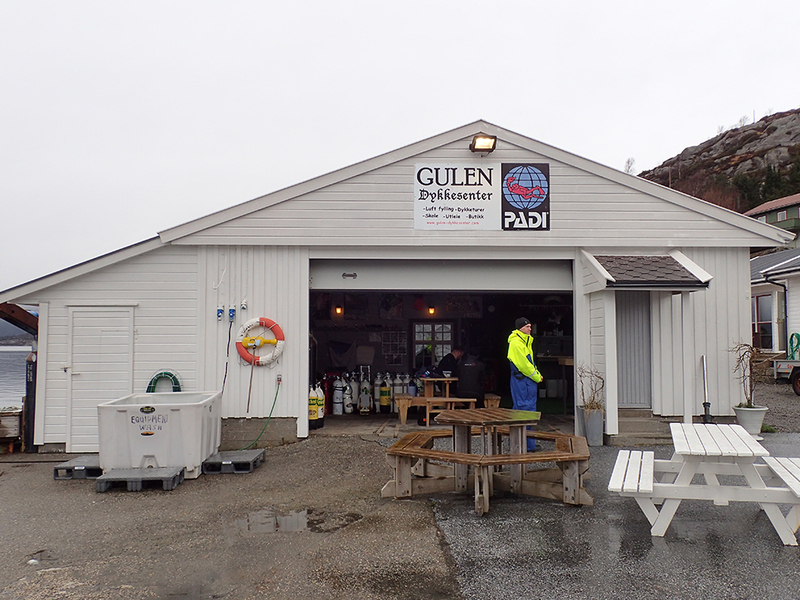 2 Comments on "Norway in a nutshell – Gulen Dive Resort"
Thank you Robert. 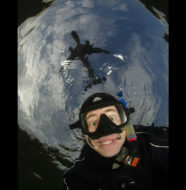 The water temperature range between 2-Celsius in winter time and up to 20 Celsius in the shallow parts during summer. Dry suit is the way to dive in Norway 🙂 Nice video, looks like fun with those Salmons.